After months of sticking to grueling campaign schedules – including debates, interviews, fundraising blitzes, and frenzied rallies – Donald Trump and Hillary Clinton are ready for American voters to deliver their verdict. With polls in many states on the East Coast closing around 6 to 8:00 p.m. (early afternoon in Hawai‘i), the results of the 2016 presidential election are expected to be announced by the time most Hawai‘i voters have cast their ballots – though some may still be voting once news outlets declare a winner later in the evening. (This is not unheard of, as in recent presidential contests the major TV networks project a winner before midnight on the East Coast, which is six hours ahead of Hawai‘i.) Another disadvantage to Hawai‘i, some claim, is that since the state has voted for the Democrat in all but two of the last 14 elections, its relative worth to the presidential contest is extremely minimal. It is all but assumed that this year’s Democratic nominee, Clinton, will likewise easily win the Aloha State. Rather, the Clinton and Trump campaigns have largely been focused on the set of “battleground” states that have traditionally swung back and forth between the two parties in recent years. This includes Florida, Iowa, Nevada, New Hampshire, and Ohio. 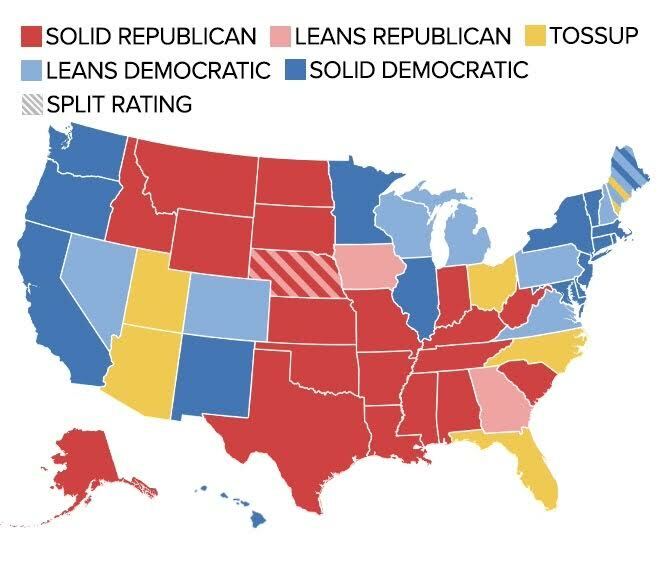 Most political observers believe whichever candidate wins most or all of these states is all but guaranteed of winning the presidency. Ohio is of special significance to Trump, since no Republican has ever been elected president without carrying the Buckeye State. Ohio has also voted for every winning candidate since 1964. Florida’s results, meanwhile, has been closely scrutinized since the 2000 election, when the U.S. Supreme Court upheld the state’s vote tally giving George W. Bush a 500-vote victory, and with it the White House. If modern precedent continues to hold true for this year’s election, then Americans will effectively know who their next president will be within hours of the polls closing. However, the popular vote – as tallied by news outlets on November 8 – is not what determines who wins or loses the White House. This is because the popular vote is not inherently relevant in a presidential election. Instead, the U.S. Constitution provides that each state casts a certain number of votes – called “electoral votes” – for president and vice president. A state’s number of electoral votes must be equal to the number of U.S. senators and representatives from that state. (Since every state has two senators and Hawai‘i has two representatives, Hawai‘i will therefore cast four electoral votes.) With the exceptions of Maine and Nebraska, every state awards their electoral votes on a “winner-take-all” basis. Thus, whichever party receives the most votes (even if not a majority) receives all of the state’s electoral votes. In spite of this, many Americans assume the popular vote is what determines the next president, or at least do not understand the significance of the “Electoral College.” Historically speaking, a popular vote victory almost always corresponds to winning a majority of electors. Before 2000, the last time a party with the most popular votes lost the electoral vote was back in 1888. However, the Constitution allows each state to determine its own method of awarding electoral votes. In contemporary politics, each state has made their electoral votes dependent upon the popular vote winner. In the 19th century, however, some states used other methods, like allowing the state legislature to choose electors. Essentially, the Constitution lets each state award its electoral votes as it sees fit. When voters in 2016 mark their ballots for a particular party, they are technically not voting for the candidates themselves, but instead are voting for a slate of electors, which pledges to vote for the candidate directly. And while Election Day is officially November 8, the Constitution mandates that all electors must convene at their respective state capitals “on the first Wednesday after the first Monday in December.” It is at that time that the electors officially vote for president and vice president. This means that every state’s electoral votes, including those for Hawai‘i, will actually be cast on Dec. 19, 2016. After the electors vote in December, the final chapter of the 2016 presidential election will come to a close shortly after January 3, 2017. The Constitution states that Congress must certify the results of the electoral vote; once this occurs, the election of the next president is has been legally settled. What must be certified by Congress is whether one candidate for president and another for vice president have earned the majority of electoral votes. Since the current number of electors is 538, Clinton or Trump would need at least 270 in order to become president. If no candidate has 270 votes, the House of Representatives chooses the president from among the three top electoral vote-getters. (This assumes there is even a third-party candidate who wins a single electoral vote, which is not guaranteed.) Each state is given one vote, which means if a majority of representatives from a given state vote for one candidate, he/she would win the vote of that state. A majority of states – 26 out of 50 – is needed for the House to elect a president. While Clinton and Trump would face off in the House under this scenario, their running mates – Tim Kaine and Mike Pence, respectively – would face a different challenge in becoming the next vice president. The Constitution instructs the Senate, conversely, to step in if no vice presidential candidate receives 270 votes. Each senator casts his/her vote individually, choosing from among the top two electoral vote recipients, virtually guaranteeing the contest would be between a Republican and a Democrat. A candidate needs a majority of the Senate – 51 out of 100 – to become vice president. If the House is unable to elect a president but the Senate chooses a vice president, the Constitution declares that the latter shall become acting president once the outgoing president’s term expires on January 20. And, if neither the House nor the Senate can agree on a president or vice president, the Constitution is clear: the burden remains on Congress to choose another individual as acting president. Who can access the Student life Center? Will Students Take A Stand?